My son ate two bowls of this soup. I’m shocked! 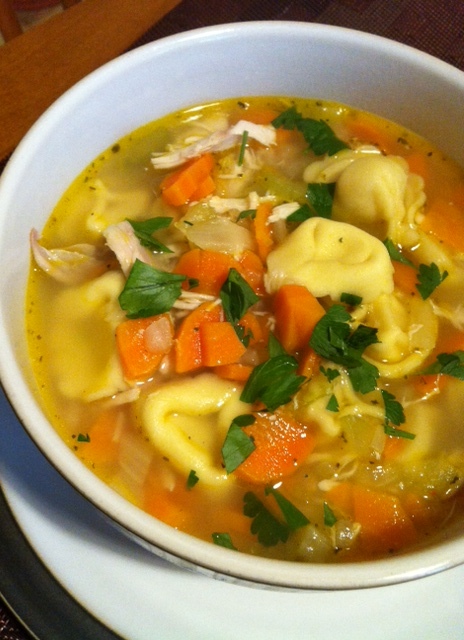 My son complains and complains about carrots and celery in soup, but he loved this recipe. My husband and I also really loved this soup. I make lots of great soups, as you can see on this blog, but this one really stands out! The best thing about this soup is that it is so EASY! My husband and I fought over the leftovers the next day. I found this recipe on Pinterest. The original recipe comes from http://www.cookingclassy.com. Instead of 4 cans of chicken broth, I used 2-900ml chicken broths. I also used Italian flat leaf parsley instead of regular parsley. 1. Heat olive oil in a large pot over medium heat, add carrots, celery and onion and saute 3-4 minutes. Add garlic and saute 30 seconds longer. Stir in chicken broth, Italian seasoning and season with salt and pepper to tatse. Bring to a boil over medium-high heat then cover and boil 5 minutes. Add tortellini and place parsley in a mound submerged into broth on top of tortellini, cover and boil 6-8 minutes longer (or one minute less than time on package). Using tongs, remove parsley (stir around in the soup first just to get all the flavour out). Stir in chicken and cook until heated through, about 1 minute. Serve warm, topped with chopped fresh parsley leaves.